One of my passions in life is reading; it has been for as long as I can remember. As a little girl my parents fostered it in me with weekly trips to the library and introducing animated storytelling into our nightly bedtime routine. Though my parents separated when I was young; their joint nurturing of my love of reading did not cease. No matter where my father lived after their separation and even still in my mother’s home, he had milk crates and shelves spilling over with books. He was an avid reader and collector. Come to think about it…I don’t think I can ever recall my dad telling me, he was reading just one book! We would have weekly discussions catching each other up on what new book we had discovered…that the other just had to read. Like him, I generally have 3-5 books on my coffee table that I am working on completing and have a growing library. Recently, as I am learning how to slow down and enjoy the lulls of life. I have begun again to read for enjoyment. Of course this means since I LOVE sharing what good finds I discovered, I want to share them with you my readers a listing of the books that I am either reading or plan to read. From the realms of history, poetry, spirituality, how-to/self improvement, fantasy, and even romance… I bring to you titles straight from my own collections. See through the windows of my soul; the current year reading list of author/blogger and poet, Lela Jefferson Fagan. 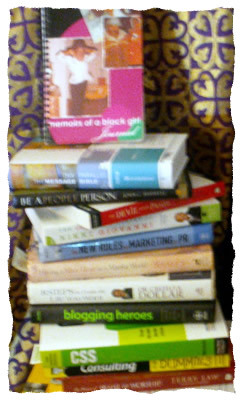 To see what I am currently reading, please visit my profile on GoodReads.com.